HARLEM — Sporting all the colors of the rainbow, 200 pre-schoolers marched up Third Avenue in East Harlem Thursday to celebrate the 40th anniversary of the Week of the Young Child. The kids' outfits and colorful hats were a celebration of diversity during a week designed to focus attention on the needs of young children and their parents. But even as the kids grasped hands to sing "The World is a Rainbow," many of their parents were wringing their hands. Looming budget cuts mean that they may no longer be able to send their children to pre-school. Planned budget cuts by the city's Administration for Children's Services would eliminate funding that pays childcare costs for 16,000 low-income children so that their parents can work or go to school. Up to 600 teachers could be laid off and almost 200 classrooms shut down. 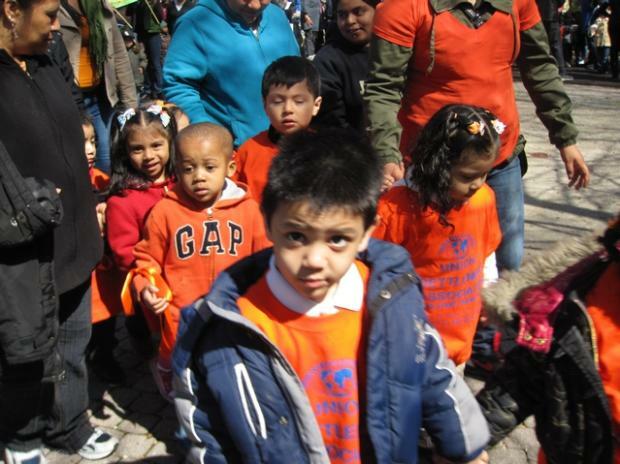 The students marching Thursday attend early childhood programs run by the Union Settlement Association. The programs serve more than 300 low-income children aged 2 1/2 to 4 in East Harlem. "I'm hoping they change their minds because I can't leave my job," said Yvonne Quiles, 40, whose 3-year-old son Darnell attends Metro North Daycare, an affiliate of Union Settlement. She received a letter saying her childcare subsidy will be eliminated in September because her now 21-year-old son received a childcare subsidy two decades ago. Even sending her child to a neighbor would cost her a minimum of $500 per month, an amount she simply can't afford on her salary as a medical coordinator for adults with disabilities. "Half of these working parents will be back on public assistance," Quiles said. Other parents are facing similar quandaries. "The proposed cuts in funding will force 70 children out of Union Settlement's child care centers and home-based child care network," said David Nocenti, Union Settlement's executive director. "Parents are committed to keeping their children safe and providing them with education, but there are simply not enough options for affordable care. Many will be forced to leave the workforce and go on public assistance in order to care for their children. ACS has said that rising costs to run the centers, combined with an expected $90 million cut in state and federal aid means they can no longer fund the programs. "The City recognizes that these service reductions will present challenges for the families who are impacted and we are working with parents to help them find alternative child care," said an ACS spokesperson in a statement. "After careful consideration, we chose to approach these cuts so that families who have received child care for the shortest duration will not be affected." In communities such as East Harlem, which have higher unemployment rates than the rest of Manhattan — and the highest concentration of public housing in the country — the cuts will hurt the most. Laura Johnson, Union Settlement's associate executive director, said the cuts mean many parents who are now working or getting job training will have to quit to care for their children. That means they will be looking for unemployment or other forms of assistance. "You can't work if you don't have childcare," said Johnson. "This is devastating for parents because it stops everything in its tracks." That also includes the learning and development of the pre-schoolers who are being prepared to enter kindergarten. Quiles said her son has begun picking up everything much more quickly since he began attending the daycare and working with other kids. "He has friends, he's good with his colors and his speaking," Quiles said. Parents may begin turning to informal childcare providers they can afford such as neighbors or friends, Johnson said. But the same level of learning will not likely be there, placing more strain on an already burdened educational system. "I'm lost. I don't know what I'm going to do when September comes," Quiles said.